What ever happened to the Manned Space Stations? Director of NASA’s George C. Marshall Space Flight Center, Huntsville, Ala.
DURING the years before Sputnik, several writers, including myself, predicted that one of the first objectives of manned space flight would be to establish one or more orbiting space stations. Today we’re busy building rockets and spacecraft to take men to the moon. We have been fabulously successful with Project Mercury, and our Saturn I rockets have shown that they can reliably haul more than 10 tons of payload into orbit. Yet little is heard of manned space stations. Why is that so? Actually the manned-space-station concept is just as exciting today as it was 15 years ago. There is absolutely no doubt that this country will have one or several such stations in orbit within a very few years. The reason a project for a space station hasn’t been pushed more aggressively is simply that we don’t know, yet, exactly how to build one best suited to the purposes it will serve. Gemini to point way. As long as our manned-space-flight experience is limited to a total of about 53 hours logged by our astronauts, we cannot possibly specify the layout of a space station and all its many-faceted equipment in enough detail. Orbital flights by Gemini astronauts, in their two-man spacecraft, soon will help close this gap in our experience. And, if the Air Force receives a long-awaited go-ahead, so will its Manned Orbiting Laboratory, designed to study man’s ability to perform useful military tasks in space. The Gemini astronauts, for the first time, will try orbital rendezvous and dockingâ€”a maneuver necessary to the operation of any space station. Inside and outside of their spacecraft, they will perform a whole slew of scientific observations and experiments. All this will give us a better idea of how much more can be accomplished by a manned space station than by an automatic observatory in space. â€¢ Astronomical and astrophysical studies of sun, moon, planets, and the surrounding universe. Advantages of a space station would be freedom from atmospheric turbulence, and from the filtering effects of the earth’s atmosphere on ultraviolet and other radiation. 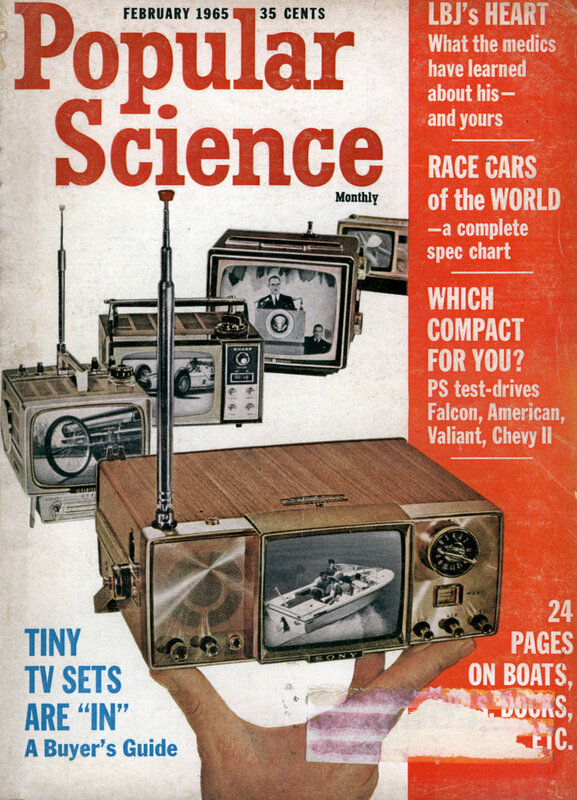 â€¢ Observations of the earth’s surface, for many purposes: weather forecasting, storm and flood warning, iceberg patrol, snowfall and water-resource management, prediction of volcanic eruptions and landslides, detection of forest fires, military reconnaissance, and navigational aid for ships and aircraft. â€¢ Physical, medical, and life-sciences research. A space station is the ideal place for research on the effects of a number of conditions impossible to simulate on earth: prolonged weightlessness, space radiation of various types, a near-perfect vacuum of unlimited size. â€¢ Maintenance of complex space installations. Consider a TV broadcasting satellite in a synchronous orbitâ€”a station, seemingly standing still in the sky, to which anyone on earth below can tune his receiver. Several hundred kilowatts of transmitting power would be required. It may well prove to be economical to furnish a station so complex and powerful with a permanent maintenance crew, which would be exchanged at periodic intervals. â€¢ A deep-space assembly site and jump-off platform for manned expeditions setting out to land on other planets. Such missions will require nuclear-powered spaceships, assembled and fueled in a low earth orbit from sections and propellants brought up by chemical earth-to-orbit freighters. When we set out to design a space station, however, we face a strange paradox. To keep a man alive in outer space we have to put a barrier between him and spaceâ€”a pressurized cabin or suitâ€”but it must not deprive him of the very gains he sought in space. If he cannot effectively observe the earth beneath him or the universe about him, he’ll be like a man trying to study undersea life from a windowless submarine. A related problem is raised by the question of possible ill effects from a long period of weightlessness. Early space-station designs called for doughnut- or dumbbell-shaped stations rotating slowly about their hubs, so that centrifugal force would replace at least part of the missing gravity. But a spinning platform would handicap observers of the heavens and the earth, since telescopes re-quire a steady aim. Must space stations spin? We still do not know whether artificial gravity will be necessary from the medical point of viewâ€” and, if so, whether a daily five-minute spin in a small centrifuge built into a non-rotating space station might not suffice to make both the astronaut and the doctor happy. But the coming Gemini orbital flights, of up to two weeks’ duration, will tell us a great deal about man’s ability to endure weightlessness for longer periods. In any case, artificial gravity undoubtedly would add to the comfort of everyday life in a space station. So a rotating design looks attractive for a manned TV station in space, and for the crew quarters of an assembly station for expeditions to other planets. For such long tours of duty, comfortable living quarters for the crews will probably take precedence over suitability for scientific observations. Space stations thus may differ in design according to their respective purposes. Likewise, their uses may dictate orbits of widely different types. Unless the mission specifically calls for a high orbit, a low one offers the general advantage of lower earth-to-orbit transportation cost. A low west-east orbit, only slightly inclined to the equatorial plane, is particularly economical: It gives a rocket ship, at launching, full advantage of the “boost” resulting from the earth’s west-east rotation. Such an orbit would best suit a space station intended as an astronomical observatoryâ€” or as a physical and life-science laboratory. A relatively low polar orbit, in contrast, seems advantageous for earth surveillance, since it would enable an observer to see every point on earth at least twice in 24 hours. For an assembly site for deep-space expeditions, a low orbit in the equatorial plane offers certain advantages. And a TV station “fixed” in space automatically calls for an equatorial orbit, with the added requirement of a 24-hour orbital period (which, in turn, sets the required orbital height at about 23,000 miles). The answer: many stations. To sum up, manned space stations are bound to come. Because of their varied potential uses, and different requirements, it seems likely that we shall have not one but a number of space stationsâ€”and that, in due time, other countries will have theirs, too. It may well be, however, that several mission assignments for future manned space stations can be combined and served by one central station, when all participants can agree on an identical orbit. To reconcile the missions’ different needs as to design, the orbiting space center may consist of a group of small free floating “mission” stations, clustered about a spinning doughnut or dumbbell that will serve as a combination hotel, restaurant, and office for the entire complex. Nice article, but the word “money” is absent. As for a TV station in orbit requiring a crew to maintain it, Dish Network seems to manage without it. 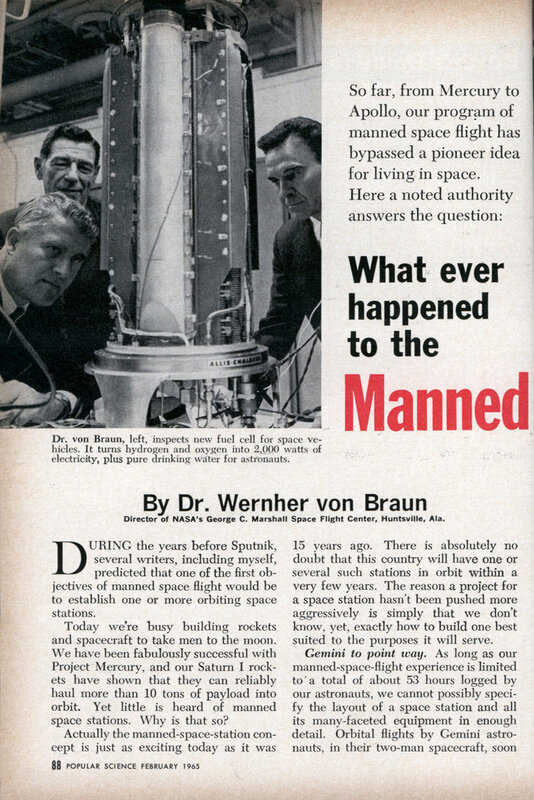 Basically, von Braun (a rocket engineer) wanted to build a space station but never developed the market for it. Believe it or not, two members of von Braun’s team are still alive and kicking in Huntsville. Konrad Dannenburg and Ernst Stuhlinger recently spoke about how the launch of Sputnik spurred America’s space efforts. Don’t worry, Branson is on the job, he’ll be running commercial space flights within 10 years.